Due to the recent interest in creating the remaining border mesa, we should see about settling on the minimal changes needing to happen in this region. This is the brown region setup found atop the border mesas. - Reduce scale of trees to 1.0 in average. - Reduce amount of container plants to 30 per cell in average. That should be it, for the most part, as the container plants composition and otherwise density of detail is already great around here and doesn't need to be addressed in the finished areas. For the remaining mesa, should there be any snow atop of it? It's the mostnorthern of the border mesas, after all. Snow depends on how you wish to make the transition from the finished Reach lands northward. The latitude isn't quite parallel with Snowhawk or HF forest (which have snow already) so if snow is going on this mesa, it should only be to the northernmost edge. I'd be up for applying these changes to the previous mesas (if that's what you have planned - it sounds like it). Regarding the new one, I don't think we need to put any snow here, although it might make it a little bit more interesting and could add some nice variation. Though - I'm a little bit unsure whether snow would go along with the overall color scheme as it stands now. So, one thing that we should change about this region is these dirtboulders as seen on this screenshot. Opposed to the grass rocks, dirt rocks only make sense as terrain edges, when the dirt atop of them is a continuation of the surrounding soil. But freestanding rocks with dirt on top of them look weird. Many of these could be replaced by blank boulders that have exactly the same proportions. worsas wrote: So, one thing that we should change about this region is these dirtboulders as seen on this screenshot. Opposed to the grass rocks, dirt rocks only make sense as terrain edges, when the dirt atop of them is a continuation of the surrounding soil. But freestanding rocks with dirt on top of them look weird. Many of these could be replaced by blank boulders that have exactly the same proportions. 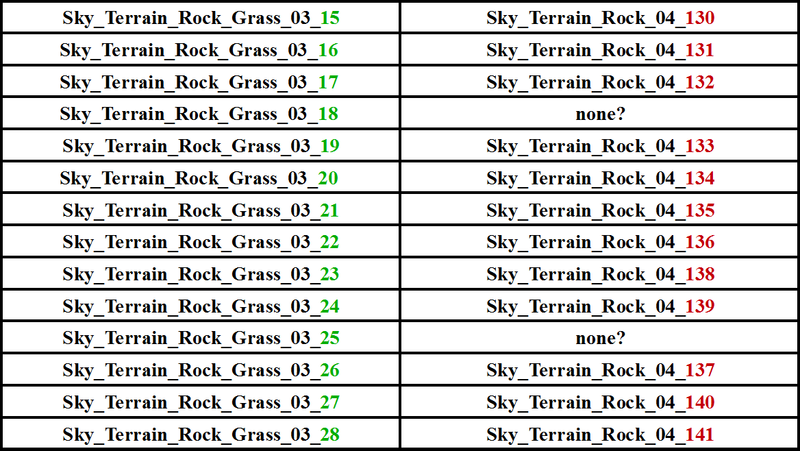 So these should be replaced, but what about the "Sky_Terrain_Rock_Dirt_[...]" ones? I reckon most of these don't have any corresponding clean version to replace them with. Aside from that, they don't look like they are supposed to be terrain edges. You don't need to remove all of these dirt boulders. The big, flat ones (which I'm calling terrain edges) are supposed to stay for sure. But the freestanding ones without a connection to the soil should either get lowered so there is a connection between the soil ontop and the surrounding soil or replaced with blank ones. For the particular ones seen in the center of the screenshot above, I'd prefer to have them replaced, myself. They don't look that great and the uv-mapping is very stretched. I would actually claim that we don't need many of those peaky mini-dirtboulders. Even their grass-counterpieces only have very limited use. Thanks for the overview pic. I've only made such a chart for the boulders myself. These rock dirt objects must have existed when I made the mesa (although I thought they didn't) since they are all over the place. Maybe someone else placed them later on? The tall boulders you mention are ugly, but the stretched uv is the same on their non-dirt counterparts. As a matter of fact, I've already removed some of these altogether because I don't like their shape.